I have a new rule for visitors. 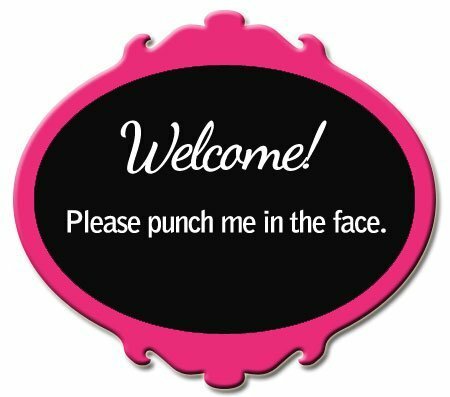 Everyone is required to punch me in the face as soon as they arrive. Their kids ran through the door to find our kids, and we greeted the adults in the entryway. Mr. Land O’Lakes and I tried to hug each other, but somehow he ended up punching me in the face. We were both a little surprised, but it didn’t hurt too much, so we laughed it off and proceeded to enjoy our brunch. We ate. We drank. We laughed. Our kids played with their kids, and everyone was having a great time. Until one of my kids became a crazy, wild monster and did something very naughty. I won’t share what happened because it really doesn’t matter. It was typical kid stuff (well, typical for an extremely naughty kid). I was very embarrassed as they gathered their children. I was torn between wanting to apologize like crazy and wanting to make a million excuses for my child’s poor behavior. But we both knew they were lying. Oh – my house isn’t clean enough for you? Well at least I didn’t punch you in the face! What? My kid peed on your leg? Well, at least he didn’t punch you in the face! You found glass in your food? Well, at least I didn’t punch you in the face! HAHA…Maybe I should start trying that! Great idea – I’m doing that at my house! And how often do you get to think, “Thank goodness I got punched in the face?” Not very, I’m guessing. Genius! Although you need to make it seem an accident each time or then they will just come back with, “but you asked me to punch you!” Could be fun coming up with different ways to get punched. You know I am DYING to know what your naughty child did! HOw naughty can it be that you can’t mention it???? DY.ING to know!! I think I love this post. No, I’m sure of it. Thanks for the laugh..I needed that..I am your newest follower!